Before showing you some cool museum stuff, let me first show you the wonders of serendipity. We were walking in Christchurch’s Hagley Park (where the botanic gardens are located) when at the fringes we stumble onto a forest not of trees but of tents, some still being erected. As it turns out, Christchurch hosts a big yearly wine festival here, which will be held in two days. And we can walk to it from our motel room! We quickly order the online tickets, a good thing since the event sells out not long after. Close call! The event was really good. One can spend the entire day in seminars or the entire day sampling wine – we chose to do some of both, which meant that, alas, we tasted a miniscule fraction of the wines being poured – but greatly enjoyed those we sampled. I’m not sure NZ makes a bad wine. One of the very interesting seminars was hosted by Riedel, makers of stemware, who was showing how much the shape of the wine glass affects the sensory perception (and enjoyment!) of the wine. Yeah yeah, you’re selling glassware, but we are a bit curious. Oh my gosh! The effect is in fact huge! Did not expect that. wall, unsupported, and looks like a topographical rendering of hills in the distance. It is created from 0.5mm mechanical pencil lead, glued invisibly together at their ends. We are impressed. Our last show-and-tell is the excellent neo-Gothic damaged-but-still-functioning Canterbury Museum. It has a nice collection of fossils, several shown here. The museum’s strengths are its Maori and Antarctic collections. Whereas other museums we’ve seen have focused on Maori art (see earlier posts of Sept 26 (Auckland Museum [Mostly Maori]) and Dec 5 (Wellington City and WOW! ), this museum looks more closely at the daily lives of the Maori – a stone-age, warrior-class people. It is fascinating. 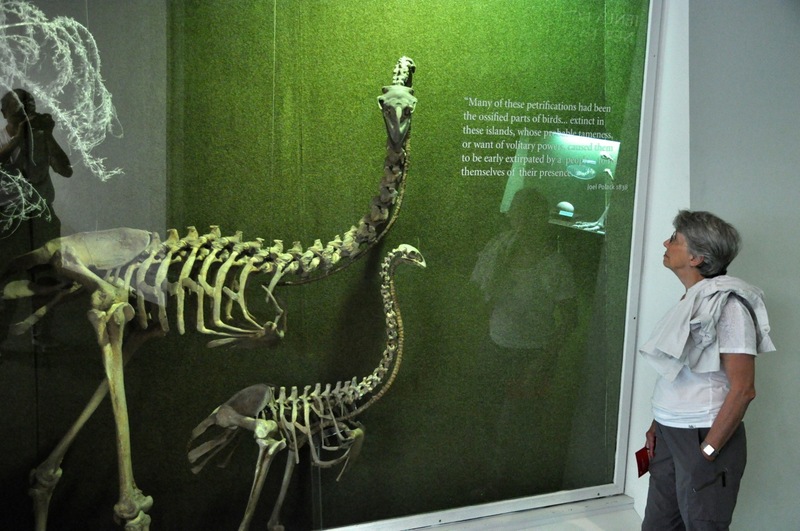 Apparently the incessant tribal warfare did not occur while the large Moa birds were alive (left picture), the Moa extinction occurring around 1500. It’s hard to imagine food being scarce in NZ, with its extensive coastline, but remember there aren’t any mammals; no deer or rabbits (although there are seals), so apparently population growth and resource scarcity led to the warfare. The museum focuses on Maori life from the 1500’s to European settlers arriving in the 1800’s. From river-mouth locations, the people moved to defensible headlands with good fishing and gardening nearby. The village was only as big as the fort (pa) allowed; food was important, but survival under constant attack more so. If you remember from earlier posts, the Maori were vicious. 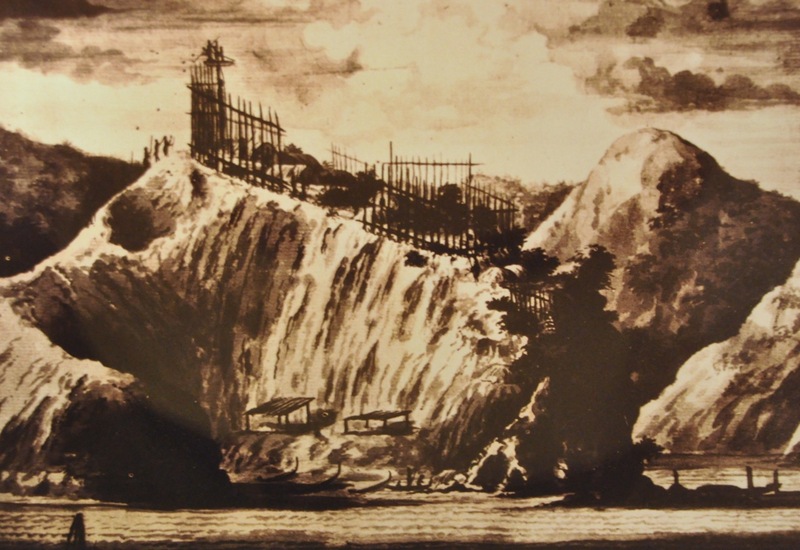 The picture to the left shows a pa on an island drawn in 1770; even on an island you had to have a pa. The dioramas below show daily life, a woman weaving a flax rain cape, another preserving birds for storage in the raised structure. In the background is the pa (picture on left). The Maori had a very well-developed stone-working technology – much needed for food and warfare. I confess I remain astounded that cultures like the Maori and the American Indian remained mired in the Stone Age and never discovered metals like copper. They certainly developed a sophisticated stone culture, with different stones for different tasks. Jade (pounamu) was the stone of choice for hardness and edge, and became quite a prized material. Found only on the South Island, when North Islanders saw it being used as an adz and were given some, it didn’t take long for a raiding party to wipe out the gifting tribe. Some pictures of their stone technology are shown below. warrior culture with the availability of European rifles in the 1800’s. As alluded to in a previous post (Sept 24, The Maori), guns quickly determined dominance and survival, and Maori would trade or sell anything for guns, including a tribe’s most cherished heirlooms – from ancestor-carved boxes to 100-person carved war canoes. I may or may not have told you about the Maori chief who was invited to visit the king in England and was presented with a fitted and decorated suit of armor. On his return trip he stopped in Australia and traded the suit for hundreds of rifles, and became a dominant force. Tools for food gathering were also very primitive, as shown below. The last two figures show stone tools used for pounding the root of the bracken fern before it could be eaten. Eating was certainly more adventurous than visiting today’s supermarket; for instance, the outer flesh of the acorn-like fruit of the Kopi (or Karaka) tree was edible when ripe, but the hard inner kernel was highly poisonous. The toxin could only be removed by steeping in running water or steaming for an extended time; then the kernels could be roasted or pounded into flour. Hmmm. Take your time with dinner, sweetie. I suspect life wasn’t so easy. wood, they extensively and beautifully carved it in fabulous patterns – originally with stone tools (!). Similarly, making wearable garments (and fishing nets) from the flax plant, including incorporating feathers, was an art in itself, incredibly impressive. Examples are shown above. Since I’ve pretty well covered Maori culture in several posts, I will not return to this topic. It was interesting to see the other side of the NZ coin, the immigration of Europeans to NZ. Europe had a lot of poor people and encouraged them to leave. New Zealand wanted them to come. Below are advertisements from the mid 1800’s selling the joys of leaving. To get on that ship, you needed to have “working class” skills – and a note from your parish clergy attesting to your character. The sea voyage to NZ, by the way, was 3 months. Today we complain about a flight taking a whole day. The museum has a fascinating section on the exploration of the Antarctic (Christchurch is the official home base for the Antarctic research stations, including the US station). 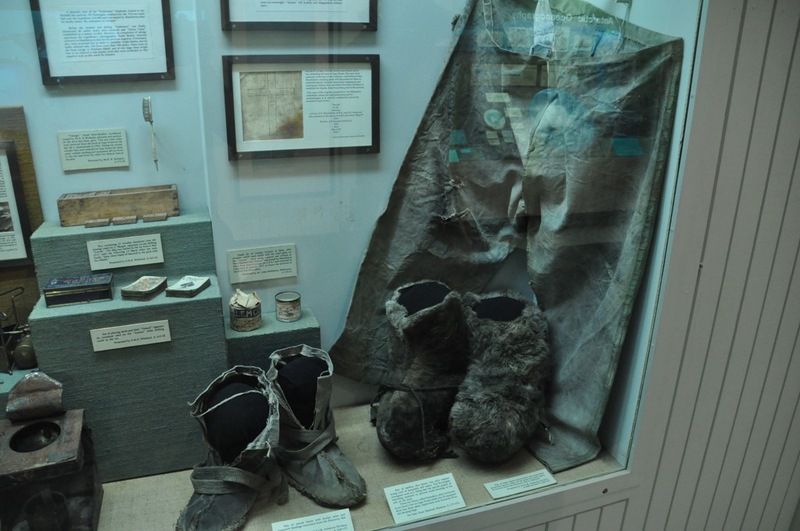 They have photographs and a lot of original stuff – boots, playing cards, etc – of the early explorers. Following an exploration of the Antarctic region in 1901-04, led by the British Robert Scott, there followed a huge effort to be the first to reach the South Pole. Shackleton tried it in 1909 using Siberian ponies, and got within 97 miles before the last pony died; short of food he had to turn back. Scott with 4 others tried it near the end of 1911, each person hauling sleds weighing 180 lbs over the last 350 miles. They reached the South Pole in the middle of January (remember, seasons are reversed on this side of the equator), only to find they had been beaten by the Norwegian Roald Amundsen a month earlier. Exhausted and short on food, the Scott party ran into blizzards on their return journey. Unable to go on, they died in their tent two months later. The secret to Amundsen’s success was the use of dogs to pull sleds, allowing the men to travel fast with little expenditure of energy – and in Amundsen’s words, “dog can be fed on dog”. Ouch! Harsh conditions simplify choices. The next challenge was to travel across the entire Antarctic continent. 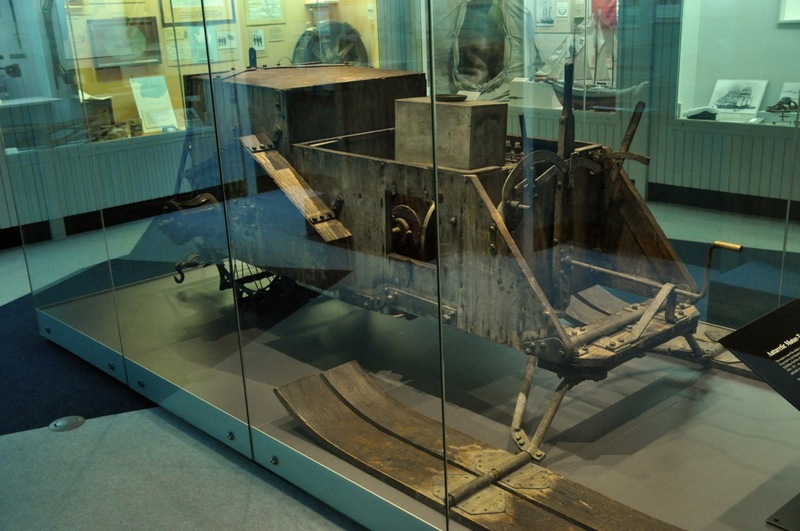 Shackleton tried it in 1915 in this specially designed tractor – remember what cars were like in 1915? 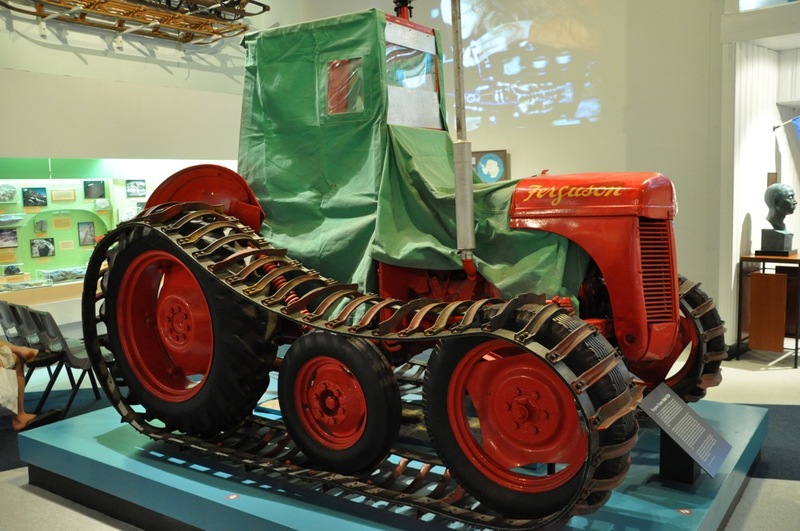 This tractor had a plywood body, a metal paddle-wheel for propulsion (visible in the rear), and a 9 hp engine. It apparently was the embodiment of mechanical perversity, and in the first attempt to travel to their base camp, they ended up having to haul it the last 12 miles, where it was abandoned. 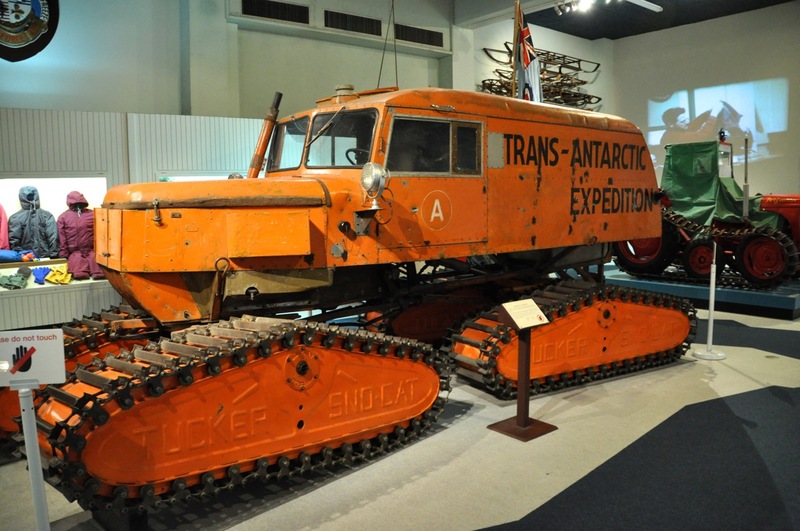 The first Antarctic crossing didn’t occur until 1957-58, when the Trans-Antarctic Expedition led by Sir Vivian Fuchs made it across using four of these Tucker Sno-cats. The Tucker Sno-cat had a top speed of 15 mph and got 3 miles per gallon. The crossing took 3 months; initial slow going and the looming winter made it a dicey crossing. In large measure the Expedition was successful due to the the help of Sir Edmund Hillary (of Mt. Everest fame) using three Ferguson tractors (the last picture). Hillary built a support base at the far end, blazed a vehicle route up the Skelton Glacier and through the Western Mountains, and laid supply depots over 700 miles nearly to the South Pole. With just enough fuel, Hillary’s party pressed on to the South Pole, the first to get there since Scott’s ill-fated visit in 1912. I don’t think the South Pole is going to make my bucket list. Next post – Oamaru and penguins! This entry was posted in East Coast & Arthur's Pass, New Zealand, South Island.